A year ago I tweeted that I was thinking 2016 was going to be the last year I blogged about Club Penguin. I ended up being correct about this. Honestly, I could have given up Club Penguin at the start of 2016, but the timing just didn’t feel quite right to me. In the latter half of 2016, my motivation went from okay levels to an almost flat line. I posted sporadically and just wasn’t really motivated to blog (or play) about Club Penguin. At the start of 2016, I was still a little interested in the game. I still felt the urge to log on each week (soon thereafter made biweekly) to check out the updates, but by the end of the year, I couldn’t care less about logging on to see what was new in the virtual world. I guess in part this is just because Club Penguin hardly updated and when they did, a lot of it was recycled content. I kept putting off writing my goodbye post. It was originally planned to happen at the very end of December, but I was taking a winter class at my college so it was difficult to find the time to sit down and write all my thoughts. So I postponed it. Then Club Penguin announced that the desktop version of the game would be shutting down today, March 29th. So I postponed it. I’m thinking 2016 will be my last year blogging about Club Penguin. We’ll see what the rest of the year brings. I’ve been vocal about being done with Club Penguin for a while now. I stopped logging back on weekly since the summer and until about a week or two ago, the last time I had logged on was in December during the Holiday Party. I’m kind of glad I ended up postponing writing this goodbye, though. A lot more has fallen into place so it feels a lot better to me to be writing this goodbye post now instead of at a prior time. The fourth of August, 2006, is when I joined Club Penguin. The previous month I was at a friend’s house and he showed me this game called Club Penguin that he discovered on Miniclip, a gaming website. I liked it, so I went home and asked my mother if I could join. A few weeks later I did. Back when I joined Club Penguin we had dial up internet and a computer running Windows 98. Oh, how times have changed. I first started getting involved in the Club Penguin community in December 2006, four months after first joining Club Penguin. Back in this time period I was only allowed on Club Penguin for 45 minutes on Fridays, Saturdays, and Sundays. I could be wrong but I think I might have negotiated to be allowed on for a little bit in the middle of the week, say Wednesday. I was also allowed on during the week for special occasions such as Club Penguin’s 1st Anniversary Party. I remember asking my mother if I could quickly go on the computer before school to get it since it was a limited one day event back then. She let me. Back in 2006 and part of 2007, while a few players did use WordPress for their Club Penguin website, a lot instead used a now defunct service called Piczo. It wasn’t a blogging platform; instead you could make your own website with pages customised to your liking with text, images, whatever. XAT chats were also commonly found on Piczo websites, in addition to Piczo’s “shoutbox” feature where you could leave a message for others on the site to see, saying hi or something. My first work in the Club Penguin community was helping maintain another real life friend’s Piczo website. Three months later, in March 2007, I wrote a letter to my parents asking them if I could make my own website, as at the time I was under the age of 13, the age required to sign up for Piczo. I forget what I called this website. I think it was either trainman1405.piczo.com or trainmanfans.piczo.com. I then later, for reasons I cannot recall, made -the-train-station-.piczo.com. The whole “fans” in the Piczo website was because a beta tester of Club Penguin, 8stoplight8, called his website stoplightfans.piczo.com. Fun fact, the 8s are in his name because his sister said they kind of looked like stoplights. December 7, 2007 is when I finally made CP-Memories.piczo.com, or CPM for short. A year before, back in December 2006, I had begun taking screenshots of all the decorated rooms at parties for fun and for memories. I wanted to make a website to host the images as a way for people to look back at Club Penguin’s past and limited time only events. I spread the word to a few Club Penguin Piczo friends about this new website and word spread rather quickly. Between looking at the pages and wanting to chat on my XAT chat, since it was really popular, I amassed a lot of views. Unfortunately, I do not have any pictures of exactly what CP Memories looked like. On the Internet Archive’s Wayback Machine there’s this, however, not everything is displayed the way it was. You can get the general idea, though: page list on the left, news and an XAT chat you cannot see in the middle, and the right side had the hit counter, poll, a shoutbox (also not pictured) and a few other miscellaneous things. Underneath all of that, you could also dress up a Pixel Penguin. If you want to try out Pixel Penguins, click here! While I don’t have an official count, by the end of 2011 Club Penguin Memories had over 200,000 views. I’d probably go as far as saying it was the most popular Club Penguin fan website hosted on Piczo. Although I never knew if it was legitimate or not, one time I got a notice from Piczo saying they took down the pages I had where I embedded Club Penguin’s Fall Fair games, saying they received a copyright notice from Disney. I wish I still had that notice, but it’s long gone. Another little known fact is that in April-May 2010 I nearly quit Club Penguin. It was eighth grade and I was pretty busy with other things in life and lost interest in the game. I was running track & field, had exams to study for, and of course was hanging with friends, as the teenage years are often when the social life begins. I had cancelled my membership and wasn’t logging on much if at all, but by August my interested was renewed in the game. I wanted to relaunch CP Memories. So what did I do? In October I began transferring the entire website to WordPress for this website, ClubPenguinMemories.com. All pictures of parties, stage plays, newspapers, and catalogues had to be saved off Piczo and uploaded to here, and then some. It took a few months, but my hard work paid off. 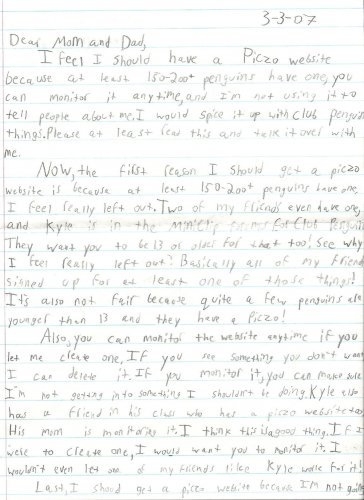 I officially launched ClubPenguinMemories.com on January 1, 2011. ClubPenguinBugs.com was also launched by me in March of the same year. In less than a year and a half Club Penguin Memories gained over one million views. Since 2011 this website has gotten over eight million views…literally yesterday of all days this website hit 8 million total views, so thank you so much for that. When I joined Club Penguin, began getting involved in the community, or even when I began Club Penguin Memories, I never once thought it (or I) would become popular, so well known that Spike Hike would follow me on Twitter and show the mobile team my blog. Absolute craziness, if you ask me. But it makes me proud to know that so many people have seen and enjoyed my work over the last ten years. Club Penguin was a big part of my life throughout my teenage and early adult years. So many big experiences and events happened throughout the duration of me playing the game. To name a few in no particular order: I became a teenager, I became an adult, I hit the legal drinking age, I got a girlfriend (soon to be 5 years and counting!) I experienced death in the family for the first time, I and moved. I was also that for nearly every Club Penguin update, which is amazing to me. Not many people can say that about themselves. I watched the game grow from being a small basic little game to a giant project filled with features. I’ve experienced multiple generations of Club Penguin and have met a countless number of players. I still remember the name of the first player I met on Club Penguin. Toy Boy Moo. I’ve been there when Billybob was in charge, when Spike Hike was in charge, and now as that faceless Patrick guy is in charge. Also, speaking of my girlfriend – without Club Penguin I wouldn’t have met her. Which is seriously crazy to think about. These things really do happen for a reason. Had I quit Club Penguin back in 2010 like I nearly did, we wouldn’t have met or been together. Had I quit Club Penguin not long after joining, we wouldn’t have met or been together. Had I not joined Club Penguin, we wouldn’t have met or been together. Had Club Penguin not existed, we wouldn’t have met or been together. I don’t really have any regrets about Club Penguin. If anything, I just wish I didn’t wait until 2010-2011 to move to Piczo, as Piczo did showing up on Google, and website views do matter even if I was never in this for the fame or money. ? On a more serious note, though, if I had known they were going to close the original game down in 2017 I probably would have tried harder to keep pages up to date showing catalogues and such, as I stopped a few years ago…but it’s too late for that. Oh well, it is what it is. Whether I’ve spoken to you not at all, once, one hundred times, or one thousand times, I thank you from the bottom of my heart. Club Penguin was an amazing game filled with amazing people, and those amazing people are now a part of Club Penguin Island. Your support over the years has really meant a lot to me, more than I’d ever be able to formulate into words. Simply saying “thank you” doesn’t cut it. But seriously, thank you. Your presence in my life between 2006 and 2017 is not going to be forgotten. To the members of the Club Penguin Team both past and present, I thank you for your contributions, big or small, to Club Penguin. You helped shape the game I played. I also thank you for putting up with me, my trolling, and my complaints. I wish the team the best of luck with Club Penguin Island. I sincerely hope it’s a success and the game is able to live on. I’ve thoroughly enjoyed showing you what’s new on Club Penguin, what was on Club Penguin the past, helping you with Club Penguin related things, attending meetups, starring in interviews, and making silly Club Penguin jokes and memes on Twitter. I wouldn’t trade these experiences for the world. What’s next for me and my websites? ClubPenguinCode.com expired last November, ClubPenguinBugs.com expired earlier this month, and I’m going to leave ClubPenguinMemories.com online for at least another year or two, granted this is going to be the final post. 5,939 posts, 1,298 pages, and 78,372 comments later, it’s time to officially call it quits; I’m done with Club Penguin. I’m not done blogging on the internet, though! I’m going to be getting back into the swing of things on my book blog, DevinsBookHub.com. I’ll also be posting Trainman1405 In Real Life posts there from time to time too, albeit under a different title. And that’s not all! I’m happy to announce that most likely beginning next week you can catch me writing on the ThriftBooks blog several times a week. ThriftBooks sells millions of used books online really cheap, often $3.59 per book plus they’ve also got coupons from time to time so you can save even more. This is an exciting new chapter for me and my life which is why I’m glad I held off writing this goodbye post. Right as I close this chapter, the next one is beginning. Waddle on, and once again I sincerely thank each and every one of you for being on this journey with me. Thank you. For everything over the last few years. We met once or twice online I believe and it was an honour. Like many others who are not joining the next step by joining Club Penguin Island, today marks the end of the fun. you had a good run dude. your experiences with this game have always been fun to read about and it’s pretty awesome that you met your girlfriend through it (i read that whole blog entry about it haha). best of luck to you. waddle on my friend. Thank you for your dedication to the Club Penguin community Trainman! Thank you for helping us, whether it’s showing where pins are located to the Meetup times. It’s sad to know that the game that’s been part of so many people’s lives for 11 years or so is coming to an end today.. Thank you Trainman for being a big part in making my childhood. I discovered your site in late 2007, months after I joined in July. I remember Piczo very well and everything on it. Nearly 10 years later, we must say farewell. I hope to still see you around and I’ll comment on your book site every once and a while. I wish you the best of luck, and again, THANK YOU for all that you’ve done. I’ll remember this site for a lifetime. You’re still my favorite CP blogger to this day. Thank YOU for being such a positive influence on the community and for hosting this blog. Wishing you the best for your future! Waddle on! Goodbye Trainman, and goodbye everyone! While seeing everyone coming together to say goodbye is definitely bittersweet, I’m happy to see that CP has impacted so many of our lives. Waddle on! Hey, I want to thank you for creating this website and for writing this blog post in specific. I remember your piczo website quite vividly (that was how I first discovered you) and I especially remember your XAT Chat! I recall there was a girl named Tiki with stars in her username who I loved talking to whenever I logged on. I miss Piczo and XAT. I even made my own Piczo site after being inspired by yours! Now I also run my own website but hey, we all start somewhere. Club Penguin was that place for us. Thanks for the inspiration and documentation of CP History! These memories are fantastic indeed. Yes! Tiki252! I wish I still in contact with her. I wonder what she’s up to. What was your Club Penguin username? I had been coming to your site for the last 5 years. Club Penguin has been a part of me for almost 10 years. Now its all gone. I regret not spending more time on the game in its final months. I miss the game already. Waddle On everyone. Hey, your website has a ton of useful stuff, such as the banners archived. How long will you be keeping the site up for? If it isn’t too long, I could try to start archiving all of the stuff like that. At least another year or two. Maybe longer. Well, plenty time to start saving on web archive I suppose! Biggest respect for you man. This blog was my go to source for everything club penguin, I remember when you was upgrading it, I was waiting and i was like I WANT TO SEE THE NEW WEBSITE I’M SO HYPED! I kept playing club penguin, Everyday, Its sad to see it go, I remember making my own blog, Because you inspired me to make it, Club penguin was the best game ever, To everybody, From this day, And to the future, Keep waddling on. We have to thank you Trainman for blogging all these years. You were a great influence for many of us, and that’s awesome. I found CPM by clicking on a banner in a CP wiki, no joke. And some days after I returned to here and constantly. You lived a lot of things! Not many penguins have saw almost the 11 years of Club Penguins with their own eyes! Curious fact:calculating, you joined when you had 12-13 years. I joined about at the same age. I would like to talk with you and other club penguins players someday, just to share stories and moments. Well, good luck in yoour new chapter, like you can see I took time to read it, but better late than never, thank you for you dedication, your helping, you good taste in blog style, your time and many others things I don’t remember right now. Waddle on and make new stories! Thank you Train for all this years of blogging and wish you the best!! RIP CPI. New version should have never replaced the old one.